Increase awareness of single family home furnace promotions through search, display, paid social. 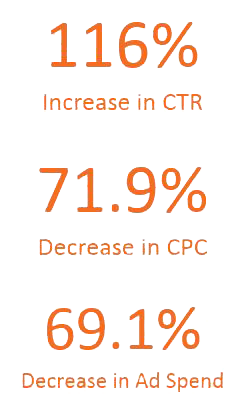 Instead of measuring awareness by impressions, Anvil used clicks in order to view measure the affect of each promotion, marketing channel, and ad creative. The budget was reallocated weekly to focus on the campaigns with the highest Click Through Rates. Anvil surpassed the previous year’s performance in all metrics except for impressions, which were consciously kept low. Despite having 48.3% fewer impressions, the number of clicks increased by 9.86% while the total ad spend was only 30.9% of the previous year’s.